In a medium saucepan fry onion in oil on a medium heat until onion is soft. Do not brown. Add cumin, chilli powder, garam masala, nutmeg and garlic and fry for 30 seconds or until fragrant. Stir in defrosted chopped spinach and coat in spice mix. Add feta and simmer for 1 min until cheese begins to melt and salt the curry. Stir through freshly chopped coriander and serve. *If you can’t find frozen finely chopped spinach the coarsely chopped spinach is still good but I often blend the mixture before adding the cheese to give the same result. You can use fresh spinach, baby spinach or silverbeet and blend before adding the cheese. 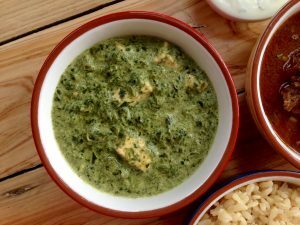 Simply remove the spinach and cream mix from the heat and blend with a stick blender or bullet style food processor for a few seconds until the spinach is very finely chopped then return to pan before adding the cheese. For a dairy free or paleo version use coconut cream and add salt to taste to replace the saltiness of the cheese.